Alan Alexander Milne was born in Hampstead on 18th January 1882. His father was headteacher of Henley House School. One of his teachers was H. G. Wells who taught at the school between 1889-1890. After leaving Henley House he attended Westminster School. A talented mathematician he won a scholarship to Trinity College, Cambridge. While at university Milne edited the student magazine Granta. After leaving university he worked as a freelance writer until being appointed assistant editor of Punch Magazine in 1906. A collection of his magazine articles, The Day's Play, was published in 1910. Milne was a pacifist but on the outbreak of the First World War he responded to the call by Lord Kitchener to join the British Army. Milne was offered a commission by the Royal Warwickshire Regiment in February 1915. After enduring basic training on the Isle of Wight he attended a course at Weymouth to become a signalling officer. Second Lieutenant Milne was sent to the Western Front during the Somme Offensive. Soon after arriving on the front-line his best friend, Ernest Pusch, was killed: "just as he was settling down to his tea, a shell came over and blew him to pieces." His brother, Frederick Pusch, had been killed by a German sniper a few days later. On 10th August 1916, Milne and four other men were sent out to run out telephone cable so that during forthcoming attack communications with battalion and brigade headquarters could be maintained. During the operation, the senior Signalling Officer, Kenneth Harrison, suffered a serious head wound from a shell splinter. Milne now took over from Harrison and the following night he laid another telephone line. As he later recalled: "elaborately laddered according to the text books, and guaranteed to withstand any bombardment". The Commanding Officer of the Royal Warwickshire Regiment, Lieutenant Colonel Charles Collison, admitted that the results of the preliminary bombardment: "Not only would it render the trench uninhabitable to our men, should they succeed in taking it, but it was plain intimation to the Hun that we contemplated some action against him in the near future." On 12th August 1916, Milne's infantry platoon left the front-line trenches. The men made their attack behind a barrage that lifted as they went forward. Immediately they came under intense German machine gun fire. None of Milne's men got to within twenty yards (18.2m) of the German trench. The battalion lost around sixty killed, and just over a hundred wounded. Of the five officers who led the attack, three were killed and two severely wounded. Lieutenant Colonel Charles Collison wrote a report that claimed his men had died bravely: "I may mention that I saw no man lying otherwise than with his face to the enemy." Milne interpreted these events differently and later claimed that this attack changed his view of the war: "It makes me almost physically sick of that nightmare of mental and moral degradation." In November 1916 Milne was moved to the much quieter trenches near Loos. However he contacted trench fever and he was evacuated to England. After his recovery he taught at a newly-established signalling school. After the war Milne returned to Punch Magazine but his spent his spare time writing plays. The birth of his son, Christopher Robin, resulted in him writing some poems and stories for children. In 1924 he published a book of children's poems, When We were Very Young, that were illustrated by E. H. Shepard. The book included the first appearance of Winnie the Pooh. In 1925 he bought Cotchford Farm in Hartfield. He was encouraged to write more children's stories and Winnie-the-Pooh was published in 1926. It was a great success and it was followed by The House at Pooh Corner in 1928. These stories took place in Posingford Wood close to Milne's home. Milne contined to write plays and novels but they failed to make him any money, unlike his children stories. Claire Tomalin has pointed out that "his fame as a children's writer made it increasingly difficult for him to interest public, critics or publishers in the other, more serious work." 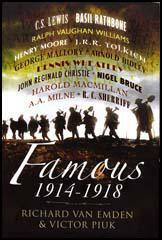 In 1934 Milne published Peace With Honour about his experiences of the First World War. This was followed by It's Too Late Now: The Autobiography of a Writer (1939). Milne served as a Captain of the Home Guard in Hartfield and Forest Row during the Second World War. However, his health was not good and in 1952 he suffered a stroke that left him as an invalid. Alan Alexander Milne died at Cotchford Farm on 31st January 1956. We sat there completely isolated. The depth of the dugout deadened the noise of the guns, so that a shell-burst was no longer the noise of a giant plumber throwing down his tools, but only a persistent thud, which set the candles dancing and then, as if by an afterthought, blotted them out. From time to time I lit them again, wondering what I should be doing, wondering what signalling officers did on these occasions. Nervously I said to the Colonel, feeling that the isolation was all my fault, `Should I try to get a line out?' and to my intense relief he said, "Don't be a bloody fool." We passed one of the signal stations, no longer a station but a pancake of earth on top of a spread-eagled body; I had left him there that evening, saying, "Well, you'll be comfortable here." More rushes, more breathers, more bodies, we were in the front line. The Major hurried off to collect what men he could, while I joined up the telephone. Hopeless, of course, but we could have done no more. Ernest Pusch wore an under-garment of chain mail... such as had been worn in the Middle Ages to guard against unfriendly daggers, and was now sold to over-loving mothers as likely to turn a bayonet-thrust or keep off a stray fragment of shell; as I suppose, it might have done.... Anyway it didn't matter; for on the evening when we first came within reach of the battle-zone, just as he was settling down to his tea, a shell came over and blew him to pieces. As a specialist officer I was, I thanked heaven, independent again. Nobody in the battalion could tell me anything about signalling; I was excused - or excused myself, it was never clear which - orderly officer's duty; never saw my company commander from one week to another; and having the whole battalion behind me on route marches could almost imagine that I was taking a brisk country walk in civilian knickerbockers.